If you plan to go fishing at any time be sure to get your fishing license!!! 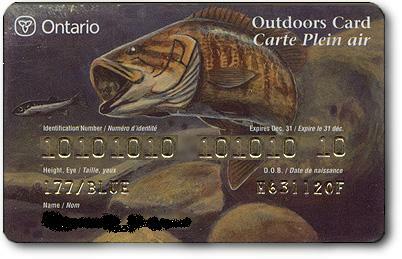 In Ontario fishing licenses come in two varieties, there is the Sport Fishing License and the Conservation Fishing Licence and both are simply tags/stickers that you attach to an Outdoors Card. Whether you plan on fishing just for a day, a week, or the whole year you need to have a license at all times even if you are visiting from another country. The Outdoors Card is just a general card that is used for both fishing and hunting licenses, hence its generic name. This way the MNR saves on costs for producing the cards. On the back of the card are divided rows where upon purchase of your tag (the license for the year) the salesman/woman will put a sticker in one of these rows, or if you purchase a brand new outdoors card you will be mailed it and will have an imprinted tag on the back. If you purchase a brand new Outdoors Card it is usually valid for three years and all you have to do is get a new tag each year. You can get these renewal stickers at most Canadian Tires, Bass Pro Shops, online at the MNR site, and at many of the smaller bait and tackle shops. The prices for the three basic Sport Fishing Licences differ and change from year to year so check the MNR site for details. License are not too expensive and are a small price to pay just in case an officer from the MNR checks to see if you have one. If you are caught without a license the fines can be quite large, they can even keep your car or boat until you pay the fine which can go as high as $5000. So be sure to get a license and play it smart. The Outdoors Card is issued provincially so be sure to get the proper license for where you plan on doing most of your fishing. If you are not an avid angler then you can even purchase a license just for one day. The price also varies from year to year but it may be a good idea if you are thinking about getting into fishing or can only get out one day a year. If you have guests from out of the country and plan on taking them around Ontario to see the beautiful sites here and to show them some of the best fishing in the world, then they too need a licence. These are temporary licences and can be good for up to a week. You can purchase these from anywhere where you can get your license tags or Outdoors Card. The Outdoors Card does not require any special id and can be easily purchased. All you have to do is give your name, address (so they can send it to you), your height in centimetres, and your eye colour. BE SURE TO KEEP YOUR LICENSE ON YOU AT ALL TIMES WHILE YOU ARE FISHING!!!!!!! Even if you are fishing at the end of your dock at your own cottage and have the license inside the cottage then an officer from the MNR can give you fine for not having the license on your person. If you just purchased your license and have not been mailed you official card, then you must make sure that you have the piece of paper proving that you have purchased your card. This must be on you at all times as well. If you’re heading out for a day of fishing be smart and get your license. The officers may check your license only once in your lifetime, but this will save you a ton of hassles and a ton of money in fines.